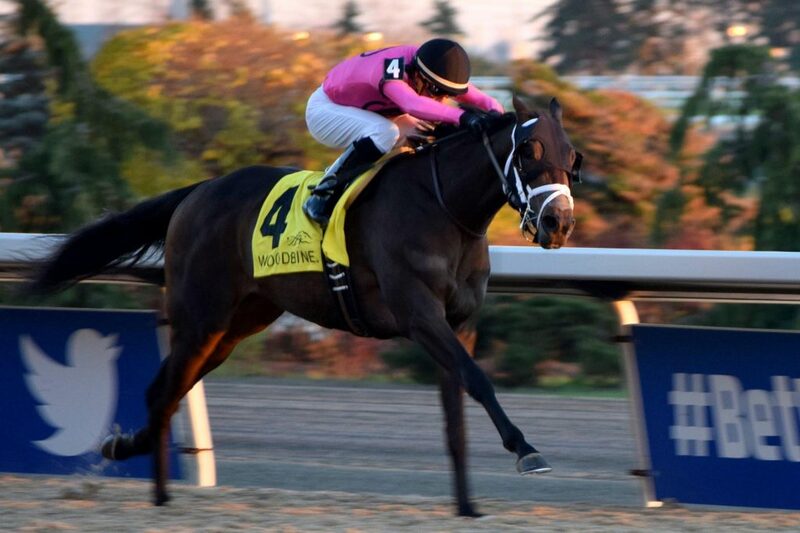 KING AND HIS COURT may have been a $3,000 yearling purchase last fall at the Canadian Premier Yearling sale but his value sky-rocketed this year as he showed some ability for his owner and trainer Alex Patykewich. A 3rd place finisher in the Grade 3 Grey Stakes to the late Golden Hawk piqued the interest of Gary Barber and Wachtel Stable, the gelding was sold by Patykewich and he moved to the Mark Casse barn. Add Lasix and a series of fast workout times and the recipe worked again – KING AND HIS COURT won the Coronation Futurity worth $250,000 on Sunday at 1 1/8 miles. Featured on Episode 10 of Talkin Horses, King and his Court was tabbed a rambunctious fellow and not quite as good as stablemate Rare Appeal by Patykewich, but the gelding never missed a purse share in 7 starts. In the Coronation, King and His Court and new rider Gary Boulanger raced inside and stalked the soft pace over a track that has been playing very fast and tricky for some horses to handle. The son of Court Vision – Pennywhistle by Grand Reward drove up the rail in the stretch run to overhaul his stablemate State of Honor and won in a time of 1:50.76, good for a 76 Beyer Figure. State of Honor, from Conrad Farms, stayed on for second over a closing Escondera, owned by Bob Harvey, one of a couple of youngsters in the field with less than perfect trips. King and his Court is the first foal of winner Pennywhistle, who was not close in 7 of her 8 career races for Robert and Patricia Weber, winning her maiden for $12,500 for her lone top three placing. Penny Whistle is a daughter of $300,000 earner, the stakes placed Whistling Maid. King and his Court was one of 3 winners on the card for the Mark Casse stable, the other two were Gabe Grossberg-owned runners: Ontario bred West L A Girl and Kentucky bred Flowmotion, winner of a 2yo maiden allowance, race 9. She looked like a superstar when she won her debut by 8 lengths but 2 subsequent outings by GHOSTLY PRESENCE made a lot of people for get about the Roger Attfield trainee. 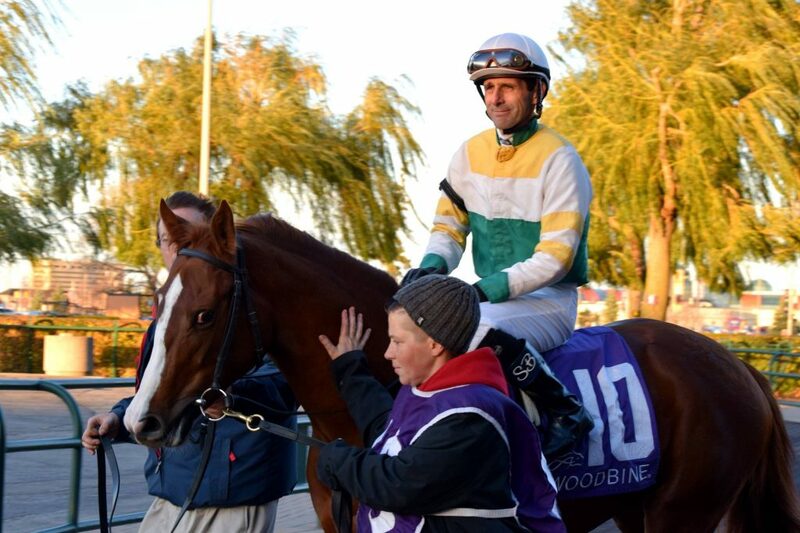 Owned and bred by Chiefswood Stable, the white-faced chestnut spring a 20 to 1 upset in the $250,000 Princess Elizabeth Stakes on Saturday, the premier race for Canadian bred 2yos. Picked up by jockey Steve Bahen when Gary Boulanger elected to take Chiefwood’s more fancied Lemon Zip, Ghostly Presence chased free-wheeling Enstone, who, like State of Honor, was ridden by Patrick Husbands, and then reeled that one in to score in 1:43.76 – a 77 Beyer Figure. The major contenders pre-race, Cindervella, who had a troubled trip, and Spring Tempest, were too far back to catch up for more than minor shares. Ghostly Presence is by Ghostzapper from Five N Forty, a Distorted Humor mare who was a very promising whose career was cut short. TOP WINNING BEYER FIGURES – Sat. and Sun. Michael Dickinson, creator of Tapeta track surfaces, sent a filly to Woodbine on Saturday and she won, her first time over a surface other than grass. The Tapeta this past weekend yielded extremely fast times. IAN BLACK saddled 2 winners on Satturday (his birthday): TIMEISEVERYTHING won for on the drop to $10,000 and was claimed by trainer Mike DePaulo from Osprey Stable and Roxy’s Vision was a stunning winner of the last race off a Fort Erie win, pulling away to win a $20,000 claiming race by 5 3/4 lengths in 1:21.43 – good for a whopping 88 Beyer Speed Figure. The winner is a homebred for Ellie Boje Farm and Jim and Jean MacLellan and it was his first sprint race since his season debut. Tommy Wong rode the 3-year-old gelding. Trainer Debbie England sent out Doug Reddington’s DUCHESS OF DUKE, an Indiana-bred by Successful Appeal, came from far back to win an allowance race a 7 furlongs on Saturday with an 87 Beyer Figure. The filly was 2nd and 3rd in 6 races before she won her maiden at 7 furlongs. She has won 2 of her last four outings. On Sunday, SASSY OMBRE led all the way to become the 8th winner for trainer Phil Gracey, who conditions the 2yo Old Forester filly for owner and breeder Gail Wood. It was the 4th career race for the flashy filly and this was an allowance race worth $47,500. WHIRLWIND FLASH was an impressive debut winner in race 3 for $7,500 claiming. It was not the smoothest of journeys but the 3-year-old by Spaniard – Flashy Katherine by Bold ‘n Flashy was up in time to win for owner and trainer Shelley Fitgerald, her first winner of the season with her 8th start. Slade Callaghan rode.